Dwarf spireas can be treated like herbaceous perennials. Cut back to the ground early each April, they still bloom that summer, although a bit later than otherwise. Cut hard in this way, they are also often denser, a bit shorter, and the foliage color may be more intense. If we grow a shrub for its foliage (barberry, privet, smoke tree and others), or we like the flowers and they are produced on wood that grew just this year (rose of Sharon, beautyberry, potentilla and others), why not cut it back to stubs every April 1, treating it like the herbaceous perennials we leave standing for winter interest? That’s what we can do with all of those on this list. Some of them you already grow this way (butterfly bush, blue mist spirea, Russian sage), and don’t even give much thought to the fact that they’re shrubs. The others on the list are just as amenable to this treatment. What can you expect will be different about a shrub treated as a perennial? Cut back to nubs every spring, a shrub may be only 2 to 4 feet tall at its height every year—shorter than otherwise, but tall enough for most gardens. Flowering isn’t usually affected except that it may come later in the season than on un-cut shrubs of the same type—not a problem if you added these plants to your garden specifically to continue the floral show after spring and early summer perennials finish their show. The foliage on first-year branches is often larger and more intensely colored than normal, which is a plus. Also, the new wood itself is often more intensely colored than older branches, so shrubs we like for their stem color in winter are even more attractive when treated this way. Beautyberry# (Callicarpa japonica). Purple berries in fall are the attraction. Panicle hydrangea# (H. paniculata) and snowball hydrangea# (H. arborescens). Please don’t confuse these with other types of hydrangea such as the blue-, pink-flowered or oak leaf types which need two-year-old wood to bloom. Redtwig and yellowtwig dogwood (Cornus alba, C. sericea). Winter stem color is the primary show. 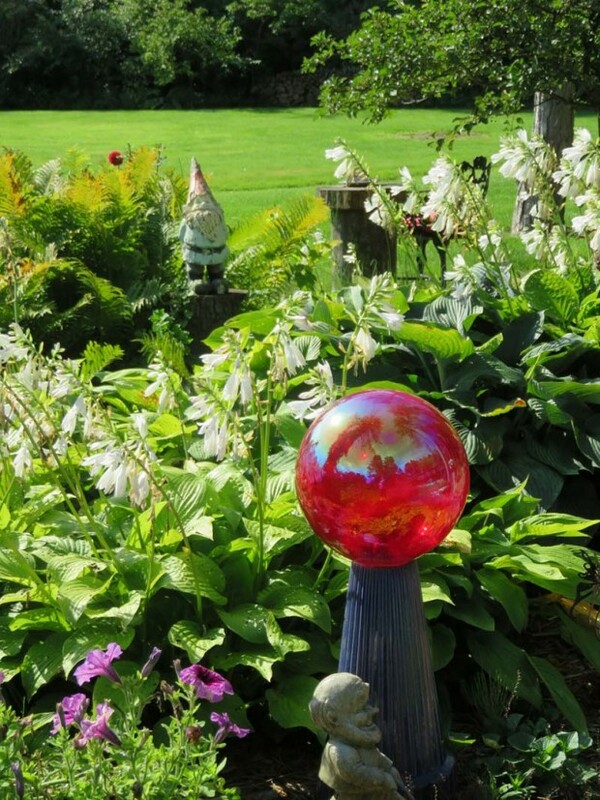 Some herbaceous perennials are so large and sturdy that they can overwhelm the rest of a garden. 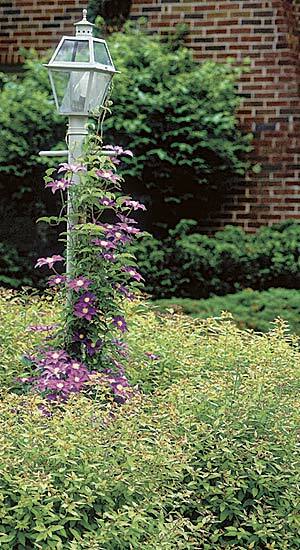 Instead of shrubs, they can be used as hedges, specimens, or even foundation plants. The only catch is that they will vacate their spots once a year, either from fall when they die back until early summer when they’ve once again reached the desired height, or if their stems are sturdy enough to stand over winter, we lose them only from early spring when we cut them back until early summer. One additional feature I require of perennials used this way is that they be long-lived and clump-forming. I want to be able to depend on them to be in the exact same place for a number of years, as I would a shrub. Boltonia (B. asteroides). 3 to 4 feet tall. White or pink flowers appear almost as a surprise every September. Cup plant (Silphium perfoliatum). 6 feet or more. Produces small sunflowers in July. False indigo (Baptisia australis). 3 to 4 feet tall. Contributes wands of blue flowers every June and can look like a black iron sculpture over winter. Goatsbeard (Aruncus dioicus). 4 to 5 feet tall. Ornamental grasses, particularly maiden grass (Miscanthus varieties) and feather reed grass (Calamagrostis acutiflora). Heights range from 2 to 8 feet. Fall and winter aspects can be stunning. Peony. 3 feet. Hardly bears listing, since it’s almost a usual thing to grow it as a hedge. Perennial sunflower (Helianthus x multiflorus). Cheery single or double sunflowers several inches across, every August. 3 to 5 feet tall. Purple bush clover (Lespedeza thunbergii). 5 feet tall, with great showers of pink flowers every September. Russian sage (Perovskia atriplicifolia). 3 to 4 feet tall. Sedum ‘Autumn Joy’. 18 to 24 inches. Like peony, it hardly bears listing since it’s been in foundation plantings for decades. 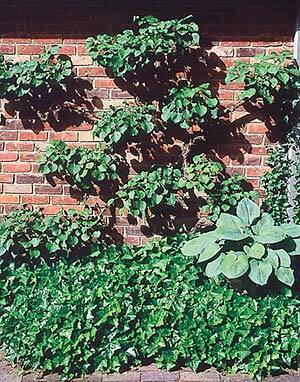 Climbing hydrangea (H. anomala petiolaris) is a very large vine but can be kept pruned to forms that range from shrubby to tree-form espalier. We think of vines when we need to cover a trellis or other vertical surface, but many vines are also happy to cover the ground. English ivy may come to mind right away, but keep an open mind to Hall’s honeysuckle (Lonicera japonica ‘Halliana’) and clematis that can be cut back in spring but still bloom that year (late-blooming species such as C. texensis and C. viticella and fall-blooming clematis C. maximowicziana, C. paniculata or C. terniflora). If I want a vine to cover the ground and provide flower, too, there are some plants I have to strike off my list. Climbing hydrangea (H. anomala petiolaris), wisteria and trumpet vine (Campsis radicans) will clamber happily on the ground but won’t bloom there. Their flowers come after the plant has established a strong vertical framework with permanent (woody) horizontal side branches. Some vines can also be convinced with regular pruning to stay in a relatively tight shape like a mounded shrub. 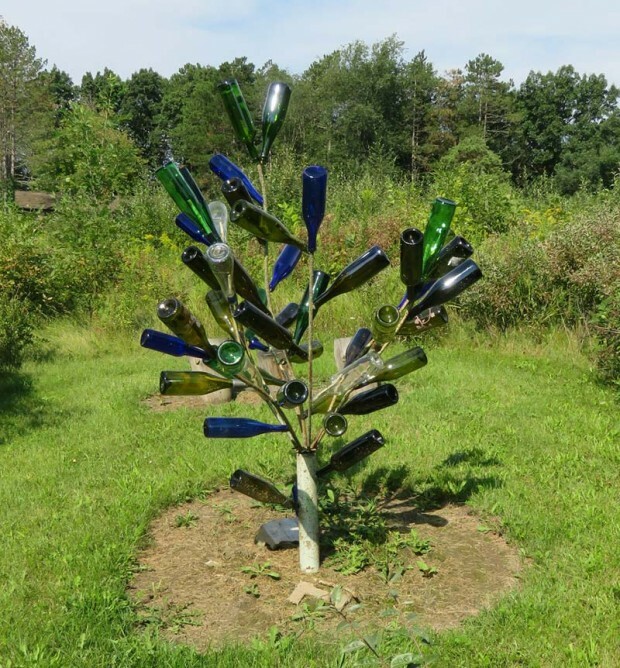 With staking, they can even be a small tree. Evergreen euonymus (E. fortunei varieties such as ‘Ivory Jade,’ ‘Emerald Gaiety’ and ‘Sunspot’) is so amenable to use as a shrub that many people don’t even know how beautifully it climbs when given a chance. 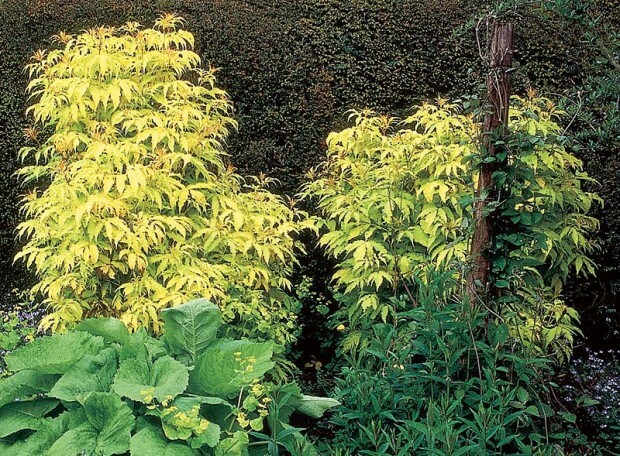 A few, such as wisteria, trumpet vine, silver lace vine (Polygonum aubertii), evergreen euonymus and climbing hydrangea, can develop main canes so thick that they can serve as trunks. Strap a sturdy young cane to a strong post, cut off all suckers from the roots and shoots from low on the trunk-to-be, and give it a few years to thicken that cane. 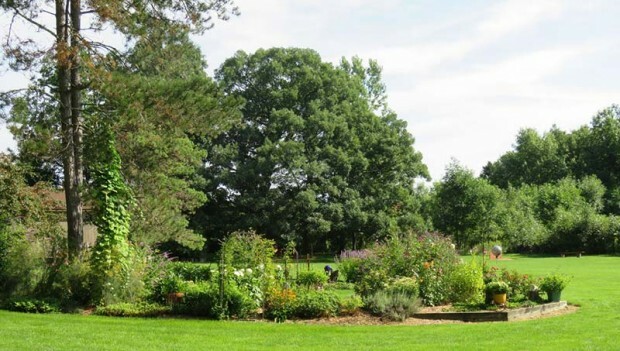 Don’t forget, though, that most of these are large plants and so their “crown”—once they’re trained as a tree—will need hard pruning at least once a year to keep it in bounds. 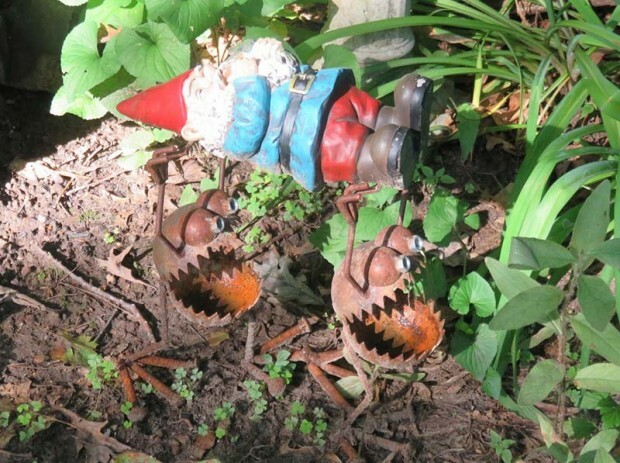 Some, such as trumpet vine and wisteria, will also sucker like a wild thing, so it’s wise to site them where they will be surrounded by mowed lawn. 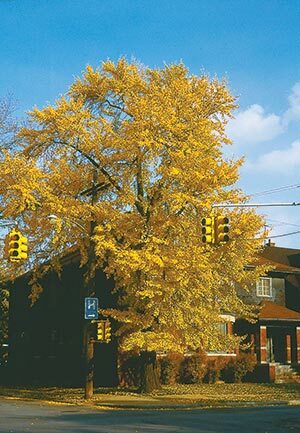 Faced with the threat of an emergency injunction, DTE Energy has agreed to temporarily stop an aggressive tree-trimming program in the Bloomfield area. 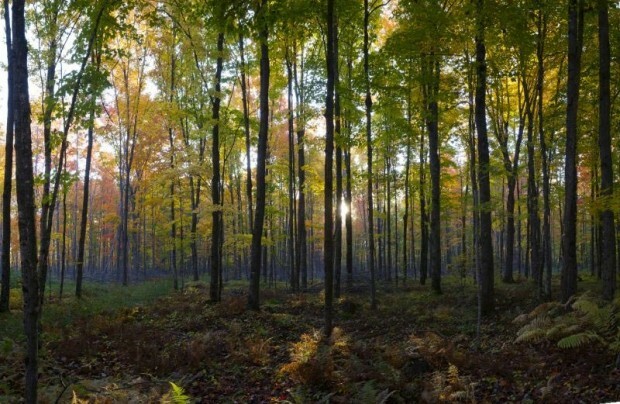 Following a directive from the Michigan Public Service Commission, DTE Energy and Consumers Energy are implementing an aggressive tree trimming program to help alleviate future power outages. Does anything look odd about these trees planted under the power lines? We drove past right after a tree crew removed the top third of each of them. 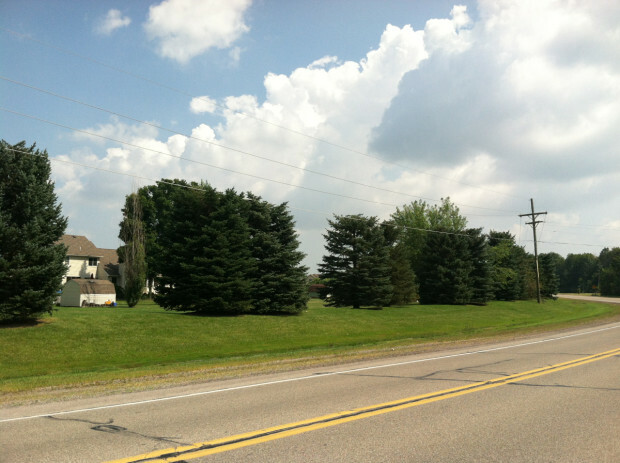 This example serves as a reminder to always keep power lines and the mature size of a tree in mind before planting. To set a new standard for the 21st century, let each gardener adopt and nurture just one tree. It has to have space to grow like this sycamore in a relative’s field. With a simple pledge, gardeners can replace unrealistic expectations for street trees with a new tree ethic and plenty of safe big trees for the 21st century. It’s my turn to speak. My mind races through a lifetime of feelings about trees. What I see on that journey both surprises me and changes my position in a subtle and important way. Here’s a replay of that mental ride which begins back in my youth. It’s great weather and I long to be outside, playing with my friends. We’re all under orders, however, to stay inside with all windows closed today. Standing at an upstairs window, I am still well under the canopy of a big elm at streetside. With the elms on each side and across the street it forms a solid ceiling. I live in awe of the elms. Planted in the 19-teens, they are shading their third generation of hopscotch games and Sunday walks to church. Some are so big that the trunk fills the entire space from sidewalk to curb. A truck unlike any I have seen proceeds along the street, a cannon on its back spraying fog into that high elm ceiling. I do not understand what is happening, but it has to do with the trees, so it interests me. 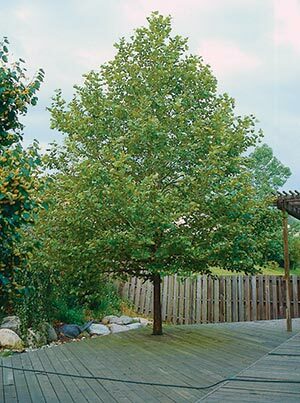 A gardener can be an advocate against threats to a tree, such as decking in the trunk, which will soon kill this linden, only 25 percent grown. Next, I’m sitting on the front steps, in my pajamas. It’s nice that the elm in front of the house is gone because at dusk we can sit here and watch bats swoop and dart across the opening. Then, I’m walking with friends, passing through alternating sections of light and shadow. We stop and kick at rings of mushrooms growing where those huge tree trunks once were. At a new ash, we take turns holding onto the trunk and pivoting around the tree. It’s such an odd thing, to be able to put one’s hands completely around a tree trunk. Later, I’m a driver, taking in the neighborhood as a whole. What a shame that the big trees are gone. Some of the new ones snapped or stayed small, but some have begun to grow. Following belatedly in the path taken by adults of the neighborhood, I resign myself to waiting for the leafy ceiling to regrow. As a young married, I shop for a house. To my husband and me, big trees are synonymous with a perfect home, but we buy a treeless house anyway. The seller tells us that the trees it had in front died a while back. There are trees on the neighbors’ lawns – not huge, but they do cast some shade. We plan to plant some of our own right away. The gardener will not count as his or her tree for posterity any tree such as this tricolor beech…which has no chance to reach full size. (Purple beech, 50 feet). A few years later we put cranky, over-tired children to sleep with slow car rides through the new, smoothly paved subdivisions that are all around. Expert now in landscaping—we’ve planted and killed three trees in our yard, but feel we now know enough to keep the fourth, fifth and sixth alive—we cluck our tongues over the dinky trees lining these roads. We’re that much more grateful for the big elm and maple next door, and the neighbors’ tolerance of small children. Those trees are child magnets—meeting places for the young of the neighborhood. We wonder if our own trees will someday support tree houses and a crowd of climbing kids, like the trees of our childhood. At high school graduation parties for our children’s friends, we look at trees in these other neighborhoods. So many streets with rows of ash or linden, trees that are still only ornament. Yet where there are larger trees casting pools of car-parking shade, the setting is quite unlike what we knew as children. These trees have a weakness to them – battle-scarred trunks and patchy crowns. 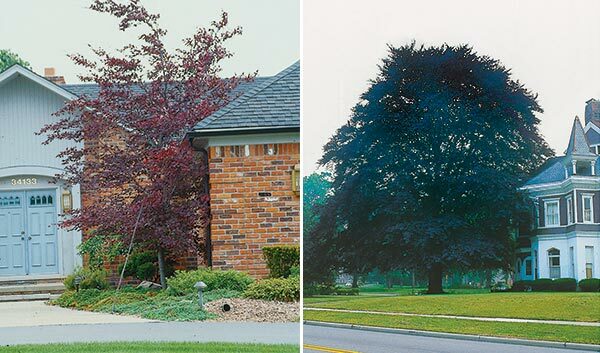 Are we noticing this because we have made trees and plants our profession, or are they truly stunted and embattled as the elms of the 1950s and 60s never were? Driving to a baby shower for a friend’s first grandchild, we pass the latest construction projects. Road work, installation of a big new drain, traffic accidents, and development of properties alongside have taken their toll. What was a green belt of big trees is a fading memory. The future is clear in this respect: Mature shade trees at streetside like this gingko will likely not be a part of the 21st century landscape. Back to the present and the discussion of a city’s new street tree planters. I’m brought up short. I have suddenly realized that our resigned waiting has lasted more than 40 years but still the big trees are not back! In four decades the replacement maples and ashes should have reached 60 feet tall or more but only a small percentage have done that. In many cases the elm replacements have themselves been replaced two or more times, having succumbed to disease, accident or side effects of paving, utility digs and reconstruction coming at increasingly short intervals. We lost our trees to elm disease, replanted and waited for the time when things would settle down and return to “normal.” While we’ve waited, the world has changed in many different ways, some of which we fail to see. One of those blind spots has swallowed our big trees. From the perspective of an era of elm-lined streets, it’s criminal to put a tree into a small hole surrounded by concrete. To those who see the reality of modern living, it’s business as usual. 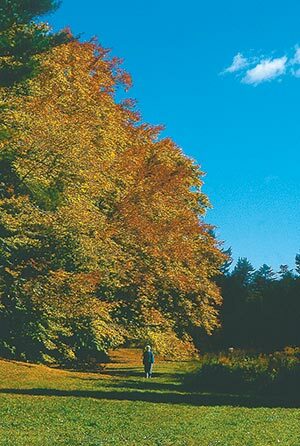 Given the proliferation of underground utilities and related work, plus the frequency of major road changes and commercial area make-overs, trees along main streets and even most side streets won’t grow undisturbed for more than a decade. They cannot ever attain their old stature, aren’t expected to, and would even be an inconvenience to routine if they did. Air conditioning units in every building and car have devalued tree shade. Trees are planted now out of habit, and/or are designed into new, instant landscapes because nothing else provides enough height and mass to offset the new buildings they front. We pave too much, dig too often, drive too recklessly, wield too many mowing and trimming tools at too great a pace to have big trees along our streets anymore. This is not evil nor is it a temporary condition. Changing our ways to once again accommodate big trees along the roads would mean that too much of the life we pave, dig, drive and rush to enjoy would also have to change, which is simply not realistic. It’s time for my generation to shake itself and see this. We have to begin lobbying not for larger planting holes where modern life makes such a thing impossible, but more frequent replacement of trees that have reached their limit in those holes. More important, we have to plant more wisely, and soon (in places not along streets! ), or the grandeur, reassurance and pleasures that come from mature trees will not be a part of our children’s children’s lives. Many of our children have already missed that experience. I hope each gardener will look around and find a place where a tree can be expected to grow to maturity. Whether that’s in a back yard, neighborhood park, or subdivision commons area, let’s each plant one appropriate new tree or adopt an existing tree with potential and protect that tree. We can research the species to determine how big it can grow and how quickly. We can project that mature canopy and root mass onto the existing landscape and find ways to give the tree room to grow to those limits, both above and below ground. I’ll water my tree during droughts, and learn what insects and diseases to watch for and fend off if they come. I’ll be its advocate when human activities around it become threatening and pass its care on to my children, heirs or successors on the land. I won’t ask that they keep everything in the landscape as I had it, just that they continue the stewardship of one particular tree. In this way we may preserve and continue to grow big trees. Better yet, we’ll maintain the connection between growing people and growing things, one of the most precious relationships of all times. Plymouth Township has reached settlements worth more than $300,000 total with the chemical giant DuPont over dozens of trees that were killed or damaged on public property by the weed-control agent Imprelis. DuPont has paid out unspecified millions in settlements nationwide after withdrawing its herbicide Imprelis from the market in 2011 and acknowledging it was causing some tree species to die, including Norway spruce and white pines. The U.S. Environmental Protection Agency said at the time that DuPont knew the product could injure or kill certain trees yet failed to make that known to consumers. Oak wilt spreads from tree to tree through connected root systems. 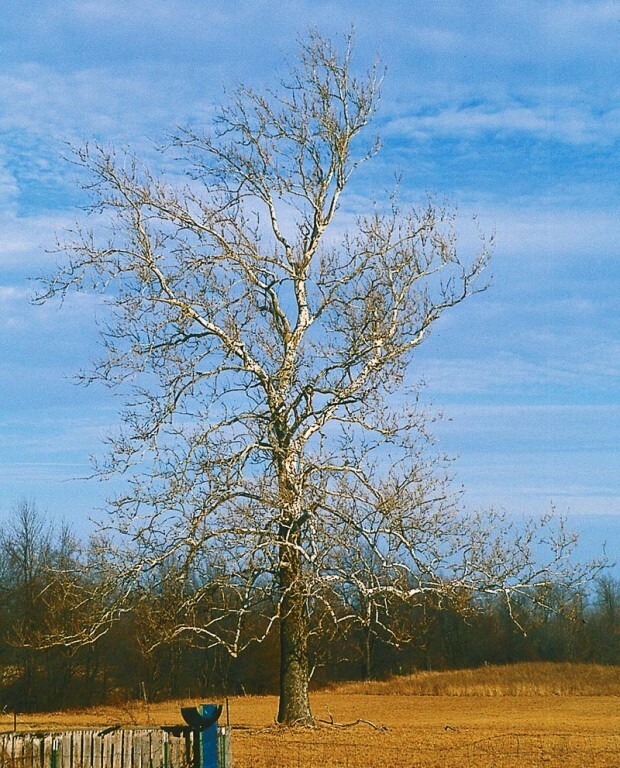 Untreated, the fungus spreads to adjacent red oak trees, often killing large groups of trees within a few years, eventually killing all nearby root-grafted oaks. These leaves are from an infected oak. 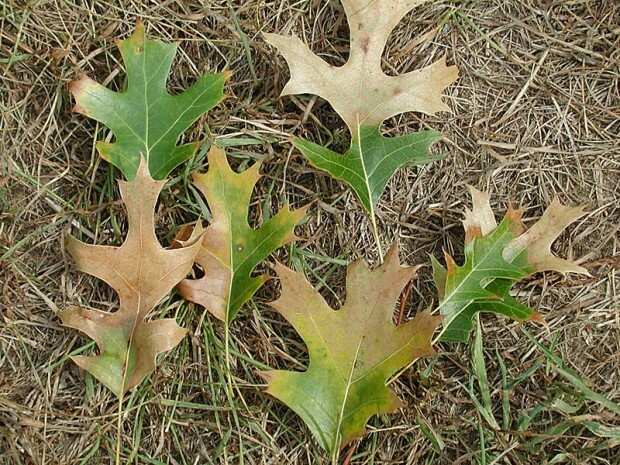 April 15 is the beginning of the yearly window when oak wilt can be transmitted from diseased to healthy red oak trees, the Department of Natural Resources announced. According to Dr. Robert Heyd, forest pest management program manager for the DNR’s Forest Resources Division, oak wilt is a serious disease of oak trees—mainly red oaks, including northern red oak, black oak and pin oak. Red oaks often die within a few weeks after becoming infected. 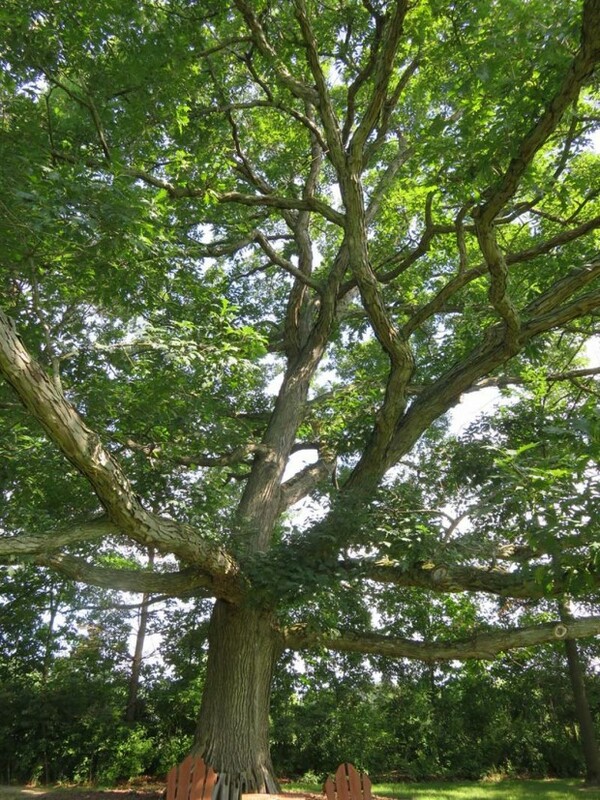 White oaks are more resistant, therefore the disease progresses more slowly. “The normal time-tested advice is to prevent oak wilt by not pruning or otherwise “injuring” oaks from April 15 to July 15,” Heyd said. Heyd added that the spread of oak wilt occurs during this time of year as beetles move spores from fungal fruiting structures on the trees killed last year by oak wilt to wounds on healthy oaks. As warmer weather melts away snow and ice, the beetles that move oak wilt become active. Spring is a popular time for people to move firewood to vacation properties and other locations. 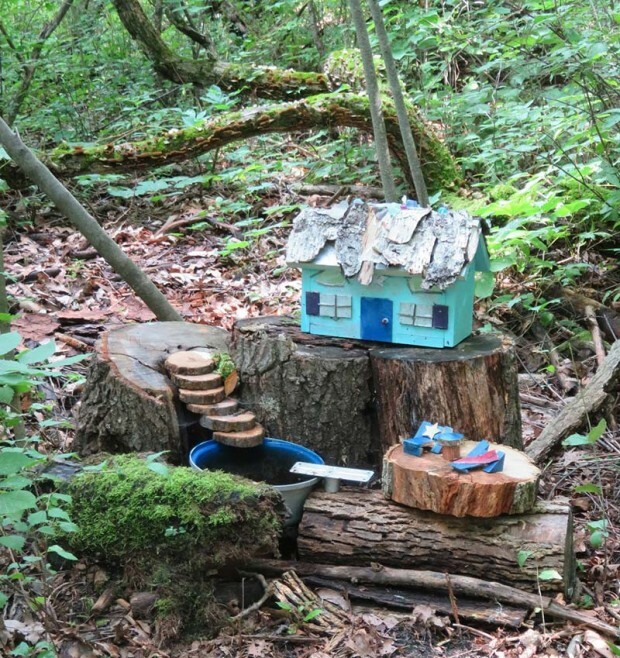 During this April-to-July period, Heyd said it’s vital not to move wood from oak wilt-killed trees. These trees are often cut into firewood and moved, sometimes many miles from their original locations. Any wounding of oaks in this new area can result in new oak wilt infections as beetles move spores from the diseased firewood to fresh wounds on otherwise healthy trees. 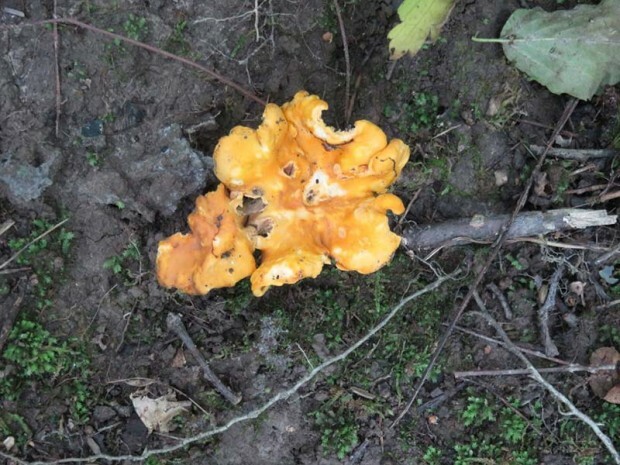 New oak wilt sites have been traced to spring and early summer wounding from tree-climbing spikes, rights-of-way pruning, nailing signs on trees and accidental tree-barking. 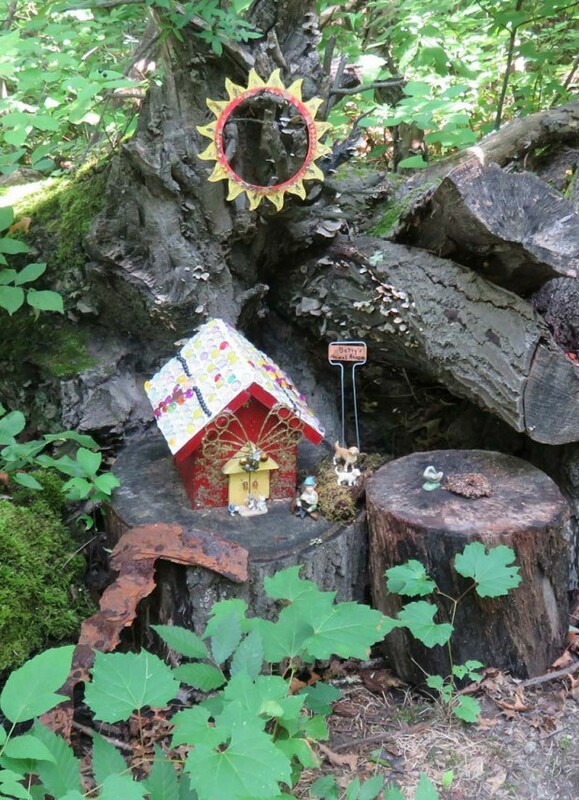 If an oak is wounded during this critical time, the DNR advises residents to cover the wound immediately with either a tree-wound paint or a latex paint to help keep the beetles away. Once an oak is infected, the fungus moves to neighboring red oaks through root grafts. Oaks within approximately 100 feet of each other—depending on the size of the trees—have connected or grafted root systems. Left untreated, oak wilt will continue to move from tree to tree, progressively killing more red oaks over an increasingly larger area. These untreated pockets also serve as a source of inoculum for the overland spread of the disease. To get more information on the background, symptoms and prevention of oak wilt, as well as other forest health issues, visit www.michigan.gov/foresthealth and take a look at the DNR’s 2012 Forest Health Highlights Report.